The period during the one-and-a-half hours before sunset on every 13th Moon day is a premier karma-dissolving powertime called Pradosham. 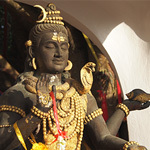 This Karma-Dissolving Prayer Service will be performed to honor Shiva, the Supreme Archetype of Karma Removal. 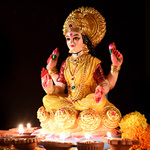 The Moon will be in Purva Ashadha, a star of success and prosperity. This star is also associated with gratitude. This is a favorable time to clear away karmas that are blocking our ability to sincerely and frequently express thanks and appreciation. Our willingness to say “thank you” greatly contributes to the attainment and accomplishment of success. Commune with the Divine Through Love Interactive Fire Lab on February 18th: This Interactive Fire Lab will be performed during 14th Moon phase, a powertime for Shiva’s infinite intelligence and infinite compassion. The Moon will be in Ashlesha, a star of comforts and mystical power. 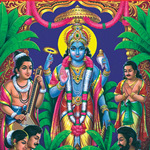 Many famous Tamil mystical poets have celebrated the bliss and joy of connecting with Shiva’s divine energy. This is a good time to ask to have our hearts unite with Shiva similar to the mingling of the red earth and rain. We can request to have a personal connection or vision with Shiva’s flower-fresh feet. We can pray for the blessing of an open heart. The fire prayer will bring blessings to be flooded with ceaseless love for the divine mercy of Shiva, he who who negates our misery and gives us happiness. This Interactive Fire Lab will be performed during 8th Waning Moon phase, a time to connect with some of the intense qualities of the divine. The Moon will be in Anuradha, a star of abundance and friendship. This star is said to be the birthstar of Lakshmi, a feminine wealth-granting archetype. 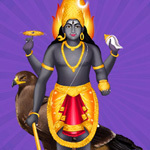 This fire prayer will invoke Kala Bhairava, archetype of time management, in his form as Swarna Arkshana Bhairava. Swarna means gold. Arkshana conveys an idea of attraction. This Interactive Fire Lab will be performed during 14th Moon phase, a powertime for Shiva’s infinite intelligence and infinite compassion. The Moon will be in Ashlesha, a star of comforts and mystical power. 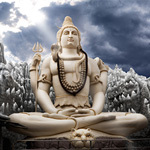 Many famous Tamil mystical poets have celebrated the bliss and joy of connecting with Shiva’s divine energy. This is a good time to ask to have our hearts unite with Shiva similar to the mingling of the red earth and rain. 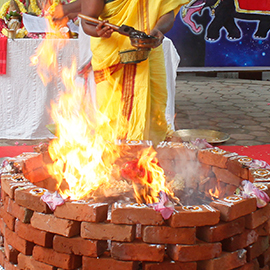 This Interactive Fire Lab will be performed to invoke Ganesha his form as Trimukha Ganapati. “Tri” means three, and “mukha” means face. 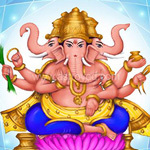 In this benign and powerful form, Ganesha is depicted with three elephant faces. He is seated on a golden lotus and is shown with six arms. It is said that the compassion of Trimukha Ganapati looks after the welfare of those who pray to him as well as the welfare of their families. We can invoke him to remove fear of the future.